Yesterday the Prep School invited back Capt. Dana Lyon for a visit. Her husband, Capt. David Lyon, is this years Class Exemplar. 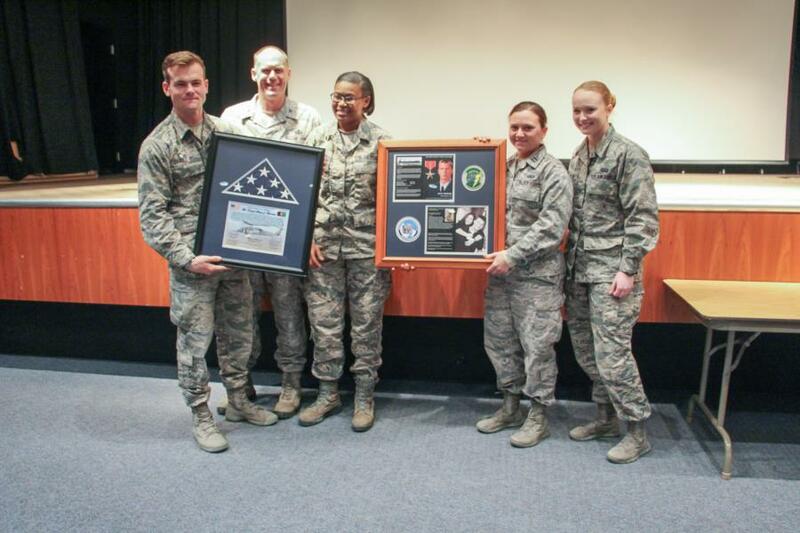 The flag was flown in David's honor over hostile territory in Afghanistan, the certificate has a picture of the aircrew flying it on their last mission in country. The committee also framed the event program for the logistics ship that was named after him. The ships mission - A contracted USAF ship that carries ammunition and other supplies to the Middle East. The Preppies have also decided from now on as a class to do 20 Push-Ups before lunch on the weekdays. The first 12 represent the month that Capt. Lyons was killed and the next 8 represent the year he graduated from the Academy. To view the rest of the pictures from the event go to Classes - Prep School - Prep Life. Or click the link below.